As much of the nation went into a deep freeze last week, the cold air brought with it those promised ducks to Florida. 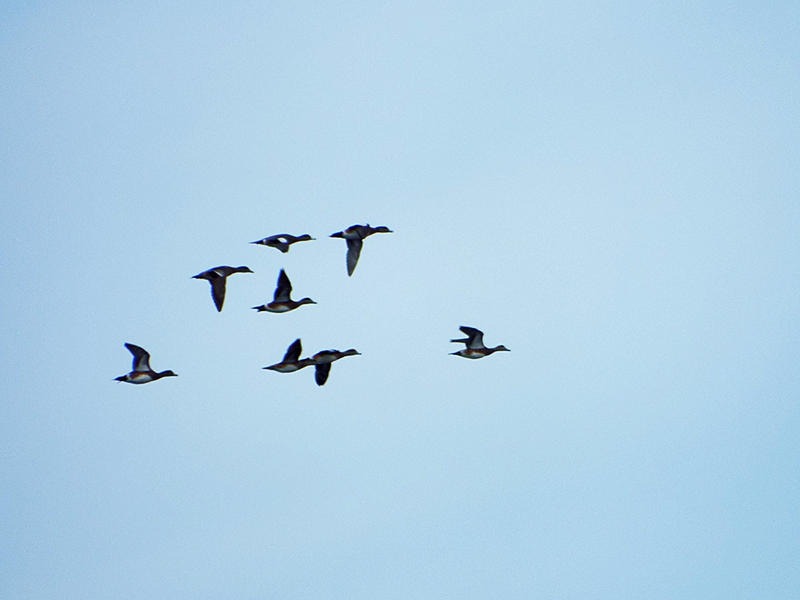 As I mentioned in my last blog post, ducks and other waterfowl only tend to migrate south when the weather or food supply dictate. When ponds and lakes freeze over, these birds cannot forage and have to move to warmer places. The ducks came in to the Merritt Island National Wildlife Refuge in massive amounts last weekend. Thousands of birds settled into their usual digs along Black Point Wildlife Drive [map], along with a growing contingent of shorebirds and gulls and terns. The first most noticeable difference along Black Point was the relative abundance of Wilson’s Snipes, feeding in the open. Snipes are usually fairly cryptic and will suddenly take to the air in an erratic zig-zag flight pattern only when approached very closely, often startling whomever is walking by. They rely on their camouflaged plumage to stay hidden. This was the largest single grouping of Wilson’s Snipes I’ve seen – almost 40 birds. 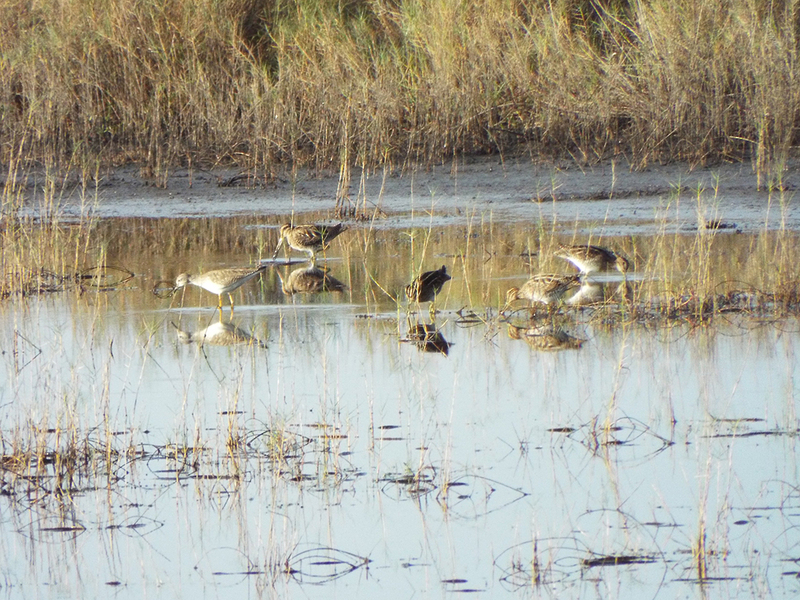 Normally secretive Wilson’s Snipes feeding in the open with Greater and Lesser Yellowlegs. 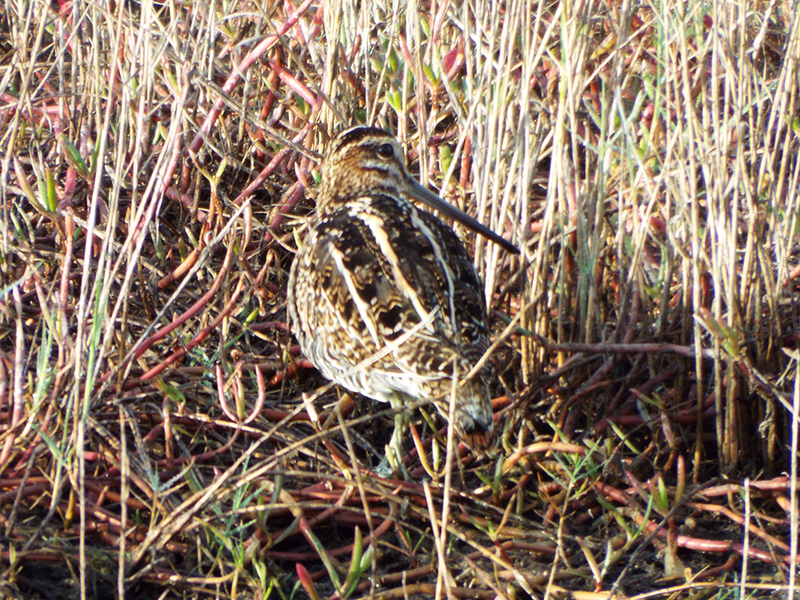 Snipe’s bills are similar in size and shape to those of dowitchers, and their feeding methods and posture seemed much alike. This bird was resting in the margin of some tall marsh grass. Ducks started appearing farther along the drive. First, Hooded Mergansers in small groups, quickly diving and scouting for prey. When food is abundant, these birds are in almost constant motion and only fully on the surface for a few seconds at a time. 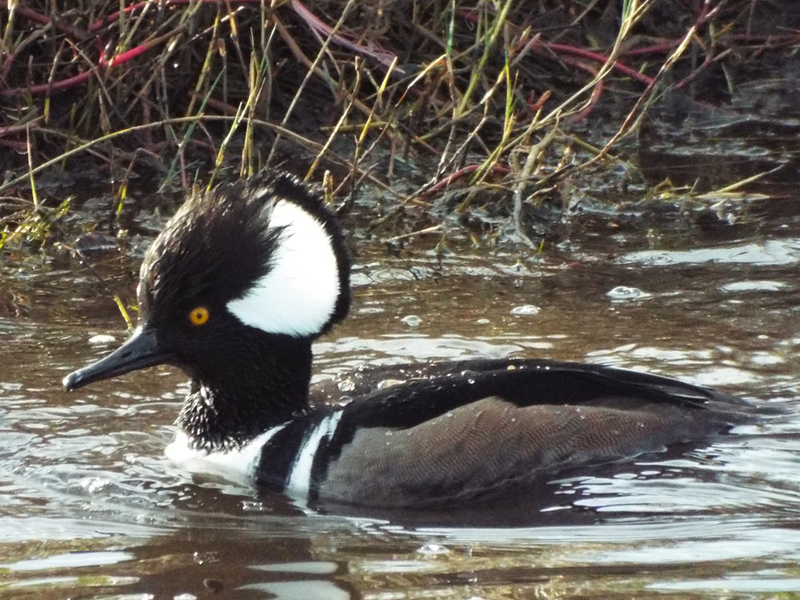 A Male Hooded Merganser in an alert posture (crest up). Blue-winged Teals had already arrived in numbers earlier in the Fall, but they have been joined by Northern Shovelers and Northern Pintails. 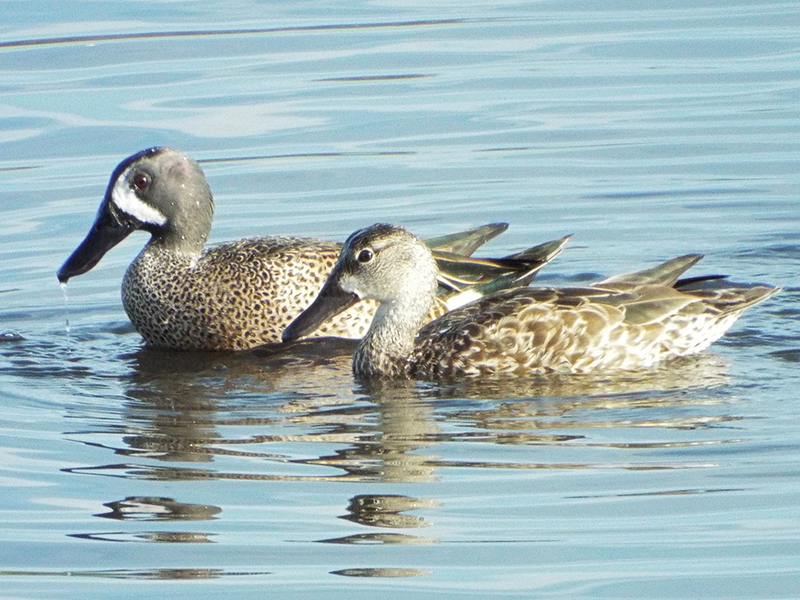 This male (left) and female (right) Blue-winged Teal pair have likely been at MINWR for weeks. Bottoms up! 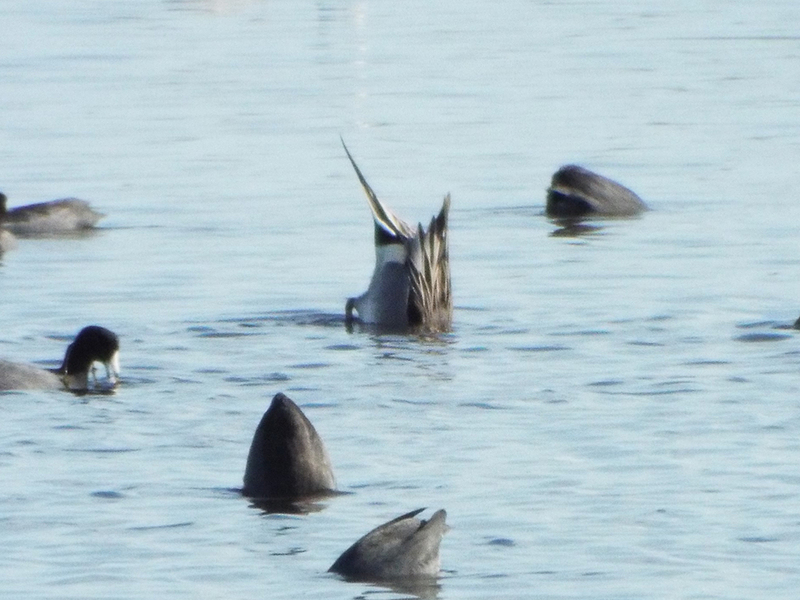 Even without breeding plumage, you can see how pintail ducks got their name. 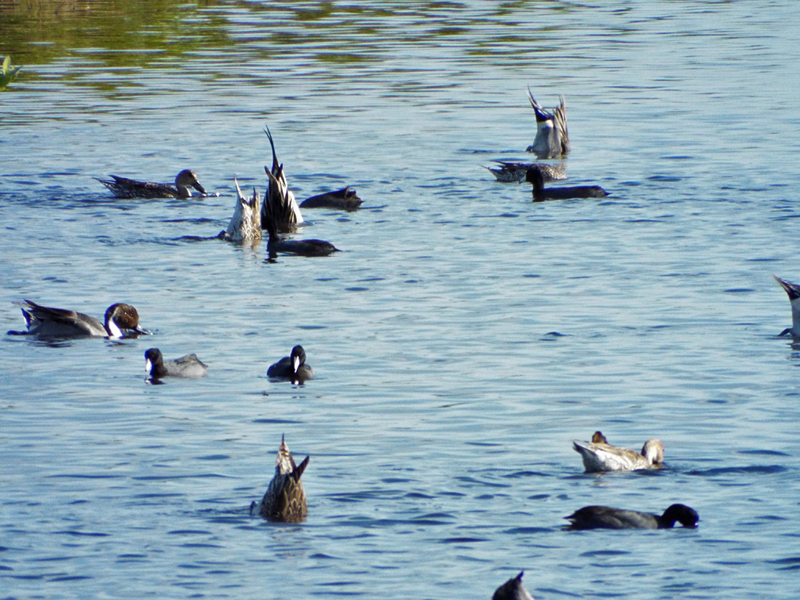 A wider shot showing Northern Shovelers, Northern Pintails, and American Coots together. Large areas of the ponds on the west side of the road (north of Cruickshank) were like this. A large flock of Redheads were just within binocular range, as well as smaller pockets of Gadwalls, Ring-necked Ducks, and even an overflight of Black Scoters. Overhead and in spotting scope range (for those that had them) were many hundreds of more ducks, too distant or backlit to identify. Of course, winter means American Coot time. Coots gather in huge rafts over the winter, using a “safety in numbers” survival strategy from predators, such as Bald Eagles. 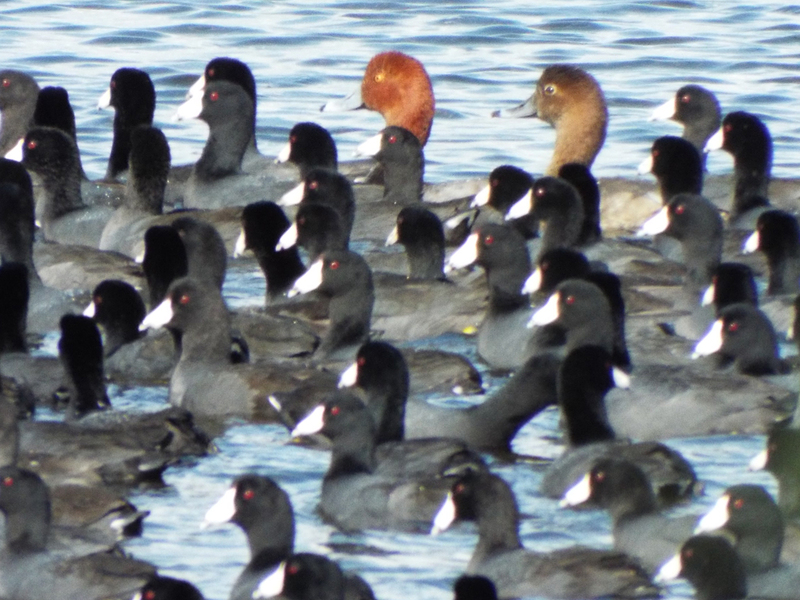 Sometimes other birds use the coots as cover, some blending in better than others. The largest rafts of coots were actually along Playalinda Beach Road (402) in some mangrove-screened ponds [map]. Google Maps erroneously calls this Max Brewster Memorial Parkway. A pair of Redheads trying to fit in. The main event the past few years along this stretch has been the large and vocal numbers of American Wigeons. Whether it’s the added privacy of the mangrove hedge or something about the ecology of the area, the wigeons have staked it out. The few gaps in the mangroves allowed for some photos. 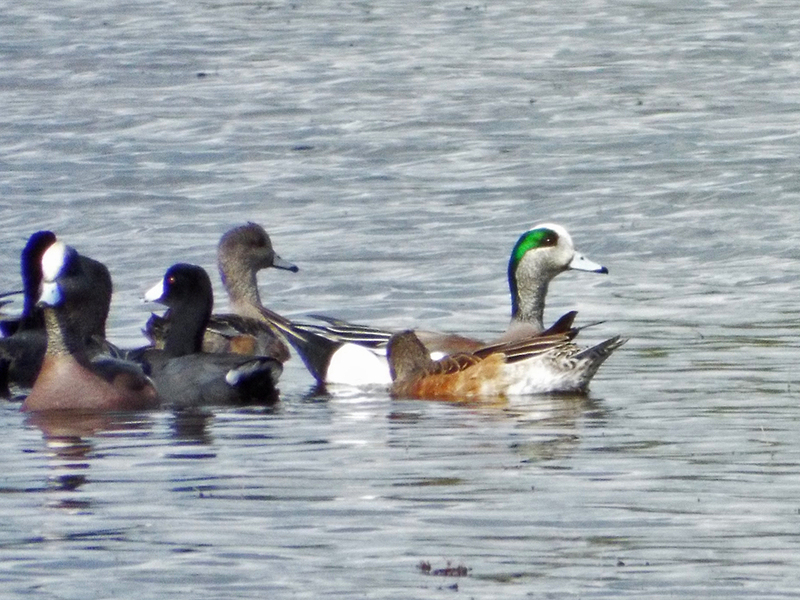 The green feathers on the male American Wigeons are spectacular when they catch the sunlight. 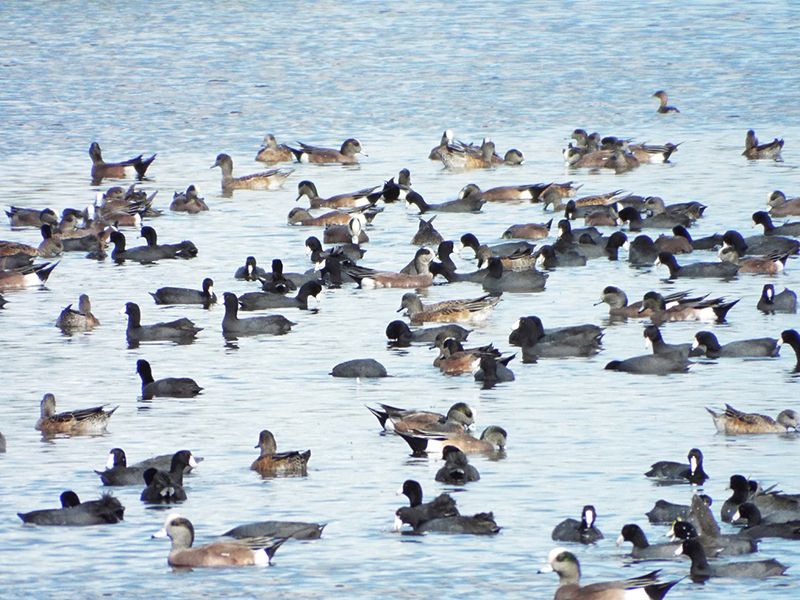 Many American Wigeons (and coots, of course). There might be a grebe or two in there, as well. The wigeons were a bit skittish. It seemed like they took to the sky at the slightest approach through the mangroves. The large flocks would break up and circle in smaller groups like this before settling down again. Hopefully the ducks will stay over longer this winter than they have. The Space Coast Birding and Wildlife Festival begins in just over a month, and the impressive array of ducks at MINWR would be a great treat for field-trip attendees! Posted on 2016 December 21 2016 December 23 by Lonely BirderPosted in BirdingTagged Birding, birds, birdwatching, Black Point Drive, ducks, Merritt Island National Wildlife Refuge.